Four Months in Marseille | Say Mar Say! - C'est Marseille! Marseille is an ideal choice for people who want to experience France more profoundly. If you have had the opportunity to see the typical highlights of France–Paris, the Loire Valley, the Provence of Roussillon and Gordes, the Cote d’Azur, perhaps–and have more than a few days and want to try to play a tiny role in French life in a French city, Marseille is a very good option. If you are an English speaker, you will stand out more than other places in France because there aren’t as many English-speaking foreign tourists here. (There are more Spanish and Italian.) When people hear you speaking English on a bus, you will be asked where you are from and they will respond with delight to learn that you are from the U.S. If you have a little more time to talk, they are amazed to hear that you have chosen Marseille from all other French cities as a place to hang your hat for awhile. And, when you explain your reasoning for choosing Marseille, they agree! We talk to everyone in French and our experience here has clearly benefited from our ability to speak French. While it’s hard for us to know if it’s a requirement to feel involved with the life here, it’s very likely. The French are known for and sometimes criticized for their social reserve. I have come to believe that it comes from the desire to protect their privacy and that of others, a learned cultural trait. This reserve is quickly overcome if you break the ice by saying something first. My experience has been that the Marseillais, true to their reputation of being outgoing if not boisterous, will make contact more often and more easily. The result is more interaction, more fun, and more involvement. At a grocery store, I offered to help a woman who was reaching high for a bottle of wine, and Peggy and I ended up exchanging conversation and contact information with the woman who told us much of her life story! A young Parisian who is a recent arrival to Marseille said that while she is checking out at the supermarket, people look at her basket and make comments about how much they like the same food. She said this never happened in Paris. Facetiously, this blog’s subtitle describes Marseille as “scary.” We knew that this was the city’s reputation; people who should know told us that it wasn’t true. I can now confirm that it is definitely not true or, more accurately, that it is no truer of Marseille than any other French city. While we have been told by locals that there are suburbs that would not be safe for any stranger at night, in town we have never sensed danger and we have walked many if not most of the city’s neighborhoods. Of course, if you find a multi-ethnic atmosphere scary, than you might feel scared even while you are not in any danger of any kind. Full disclosure: on a bus, Peggy was pick pocketed and her cosmetics bag was stolen. I don’t blame Marseille as this happens in every large city in every continent of the world. Marseille is not as clean as idyllic central Paris or as in the centre ville of Montpellier and probably other places. While garbage is picked up every night, somehow it does not all end up in the bins found on every residential block. No doubt one reason is the robust Mistral wind that blows debris everywhere. Also, outside of the major pedestrian areas there do not appear to be as many street cleaners to pick up after inconsiderate dog owners. In some residential areas, walking is made difficult because the sidewalks are narrow and inconsistently paved, with scooters and motorcycles and cars parked helter skelter on the sidewalk adding to the crowding. Yes, there is lots of graffiti art. 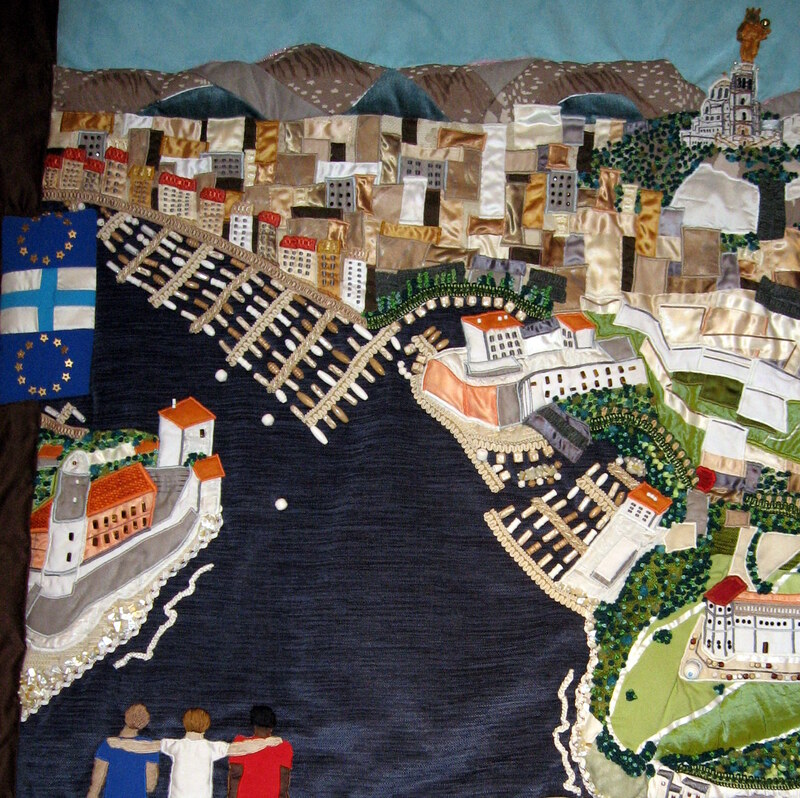 Marseille is famous for it! You may love it or hate it or come to ignore it. There are other reasons recommending Marseille for a longer stay. Prices are definitely lower than in Paris and probably lower than in other French cities. The diverse population affords less pricey international restaurants and exotic grocery stores. As the second largest city in a country that is justly proud and supportive of the arts, the cultural life is rich and varied. Marseille’s location is providential. You enjoy daily looks out to the sea and also out to the mountains that ring the city. If you are a beach person, you can hop on a bus and be at the beach in 15 minutes or less. You can hike in les calanques (see Swimming in the Fjords of Marseille.) You have easy access to Arles–a magical town on the Rhone–and to Aix-en- Provence as well as all of Provence, including the Luberon and the Var. The Cote d’Azur starts at Hyeres and is an easy drive, just beyond Toulon. For mountain lovers, the southern French Alps are surprising close-by. We have found that doing volunteer work is an excellent way to become involved and to meet people. The Centre France-Bénévolat de Marseille will match you with a non-profit suited to your preferences. Peggy is volunteering with l’Association Enfants d’Aujourd’hui Monde de Demain (see Children Today, Tomorrow the World!) and I am volunteering with ACLAP that helps senior citizens and the Association des Paralysés de France. Through volunteering and other activities, we have met some extremely friendly and interesting people who are curious about what a middle-aged American couple is doing–and learning–in “scary” Marseille. This entry was posted on January 28, 2010 at 12:15 pm and is filed under France, Living in France, Marseille, Marseilles, South of France, Travel, Uncategorized. You can follow any responses to this entry through the RSS 2.0 feed. You can leave a response, or trackback from your own site. Thanks for this entry, it’s been very helpful and encouraging! My girlfriend and I are going to spend 3 months in France and Marseille is at the top of the list. We just want to make sure there isn’t anything crazy or… scary about marseilles =P Thank you for this candid post. Hey ! Glad to hear you’re survived ! 🙂 just kiddin, i myself live near Marseille, and sometimes feel scared when walking around at night, but then again, i’m scared taking the metro in Paris in daytime ! If you like volunteering, there’s Marseille Greeter : they give free tour of the city. It could be good for english-speaking tourists to have an english tour and learn about french live from an expat perspective ! Thanks for the comment. Unfortunately, I’m no longer living in Marseille so I’m unable to volunteer. I would very much enjoy giving tours. My wife and I will be returning to visit during the 2013 excitement. I moved from Buffalo, NY to Marseille about 8 months ago and this is literally the most dead on accurate piece I’ve ever seen written. There is nothing scary about this town. This blog should be a mandatory read. I’m from Marseille, and I really liked your blog !! I lived in Marseille more than 60 years and just left the city for living in coutryside in middle of France a year ago! health reasons ! 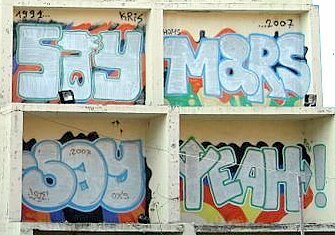 I belived I had seen everything in the city, but never found this graffiti “Say Mars Say Yeah”, who, in phonetic, say in French “C’est Marseillais” who means “it’s from Marseille”. Do you remember where you found it? I’ll ask one of my children always in Marseille to take a picture of that for me! Perhaps to use it on the website I wrote 20 years ago, at the birth of internet ! I had no tools to do it at this time, and it’s not a professional site, it was just a pleasure ! http://www.marseille-sur-web.fr/ so don’t care the quality if you visit! Some Graffiti’s are often considered as “street art” in Marseille and they can remain sometimes a long time before desappear or be cleaned so, perhaps will it always be here? My mail adress is pauldu48@live.fr, Thanks! Thanks for your comments. Where did you choose to live after Marseille? In the Auvergne, perhaps? I’m in Montpellier presently and may make it back to Marseille next weekend. Also, you asked about the graffiti: it was in le panier near la vielle charite visible from a small place. Thank you for the blog and thank you everyone for your comments. My husband and I with our 4 year old will be moving to Marseille (for my Husband’s job) from Canada. We don’t speak French so little bit scared though. However, I have questions on school, neighbourhood, housing etc. Can one of you please tell me where can I get information on good school (preferably a bilingual Montessori) and good neighborhood to live in. Any kind of help will be very appreciated. Es un gran alivio encontrar a alguien que realmente sabe lo que están hablando en blogoesfera . Con seguridad, que sabes cómo llevar un post a la luz y que sea didáctico. Más internautas tiene que leer esto.